Off-and-on good weather in Oxford this week, which has meant off-and-on touring. But more colleges were visited, a meal was had at a famous pub and a great art exhibit was seen. 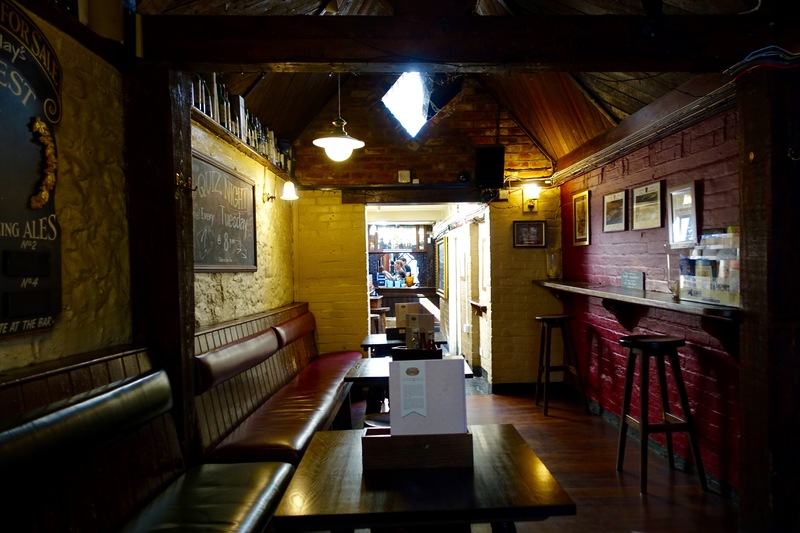 Inside the Eagle and Child pub. Let’s start at the Eagle and Child pub, which J.R.R. Tolkien, C.S. Lewis and other members of the “Inklings” referred to as the Bird and Baby when they met there starting in the 1930s. Residence building at St. John’s College. Walking past the busker playing the baritone and then across the street, we find St. John’s College, founded in 1555. In the size of the student populations, the colleges here are in great contrast to the big U.S. universities, and many colleges as well. St. John’s, for example, has less than 400 undergraduates, 250 grad students, 100 fellows and 25 lecturers, according to its web site. Former prime minister Tony Blair went to St. John’s as did novelists and poets A.E. Housman and Robert Graves, the web site reports. Tom Quad at Christ Church College. Selfie sticks are everywhere, and two tourists are using one here. 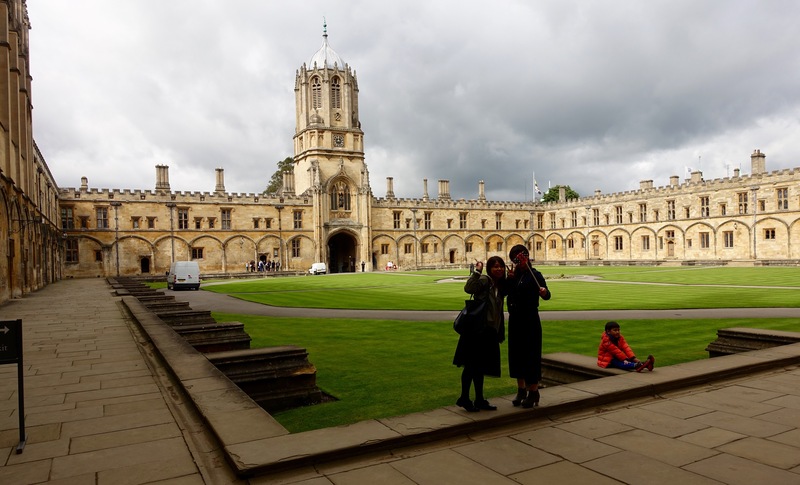 Down the street from the Eagle and Child is Christ Church College, one of the largest colleges at Oxford University with 430 undergrads and 215 graduate students. It was founded in 1524 by Cardinal Thomas Wolsey as Cardinal College. 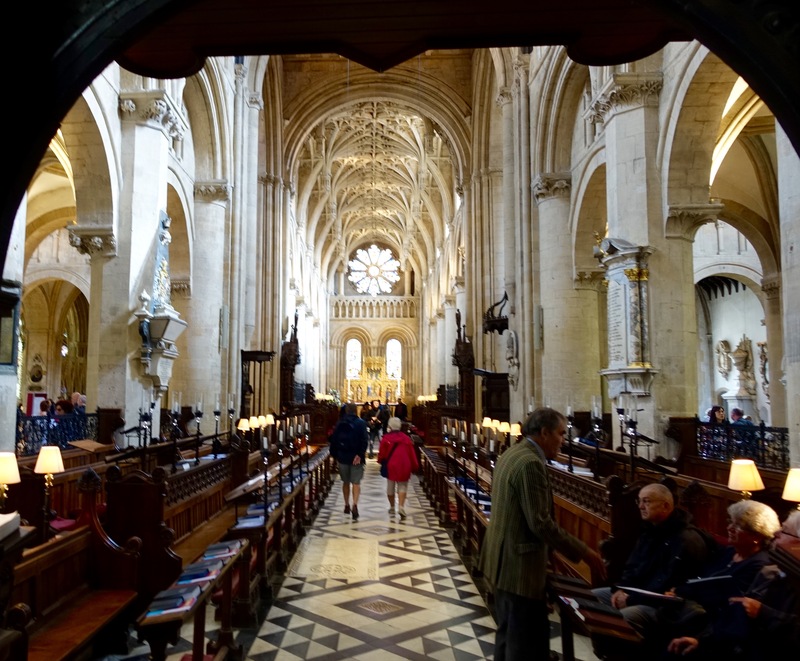 But when Wolsey fell out of favor with Henry VIII (that happened a lot with Henry), it was refounded by the king as Christ Church. 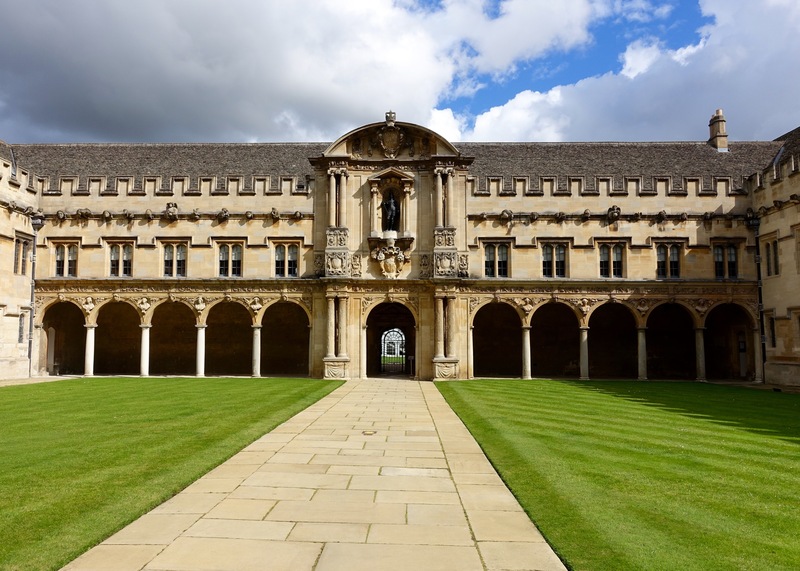 It has the largest quad, a grand dining hall and an ornate chapel with a soaring stone ceiling. The dining hall at Christ Church College. 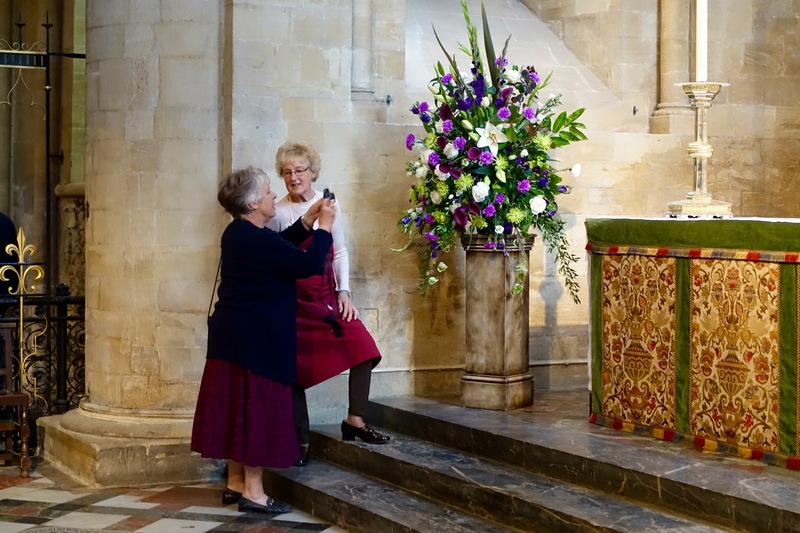 Visitors were being shooed out of the chapel today so that the Women’s Institute could commemorate their 100 years in existence. One of the women setting up for the event told us the organization got its start in Canada. Its web site says it came to the United Kingdom in 1915 “to revitalize rural communities and encourage women to become more involved in producing food during the First World War.” It’s the largest volunteer women’s organization in Britain, works on education for women and campaigns on issues important to them and their communities. The chapel at Christ Church College. The purple arrangement at the altar. My favorite chat was with a woman setting up the flowers for the event. She was not happy with the arrangement at the altar. “Purple is a receding color,” she said as she tried to bring out that color in her arrangement by playing the purple flowers against the white ones. “But it’s what they want,” she said. Looked quite lovely. 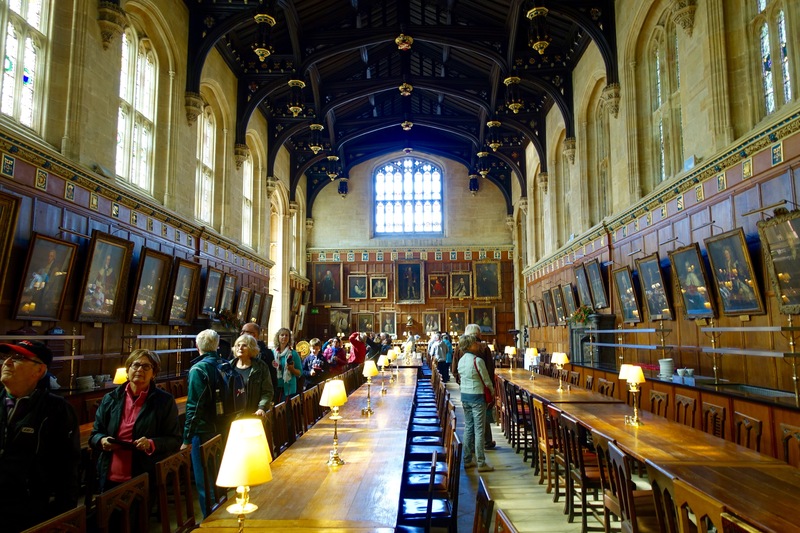 On to the dining hall, which was re-created in a studio for one of the Harry Potter movies. The “firedogs” in the Christ Church dining halls. Another famous story may have roots in the dining hall. 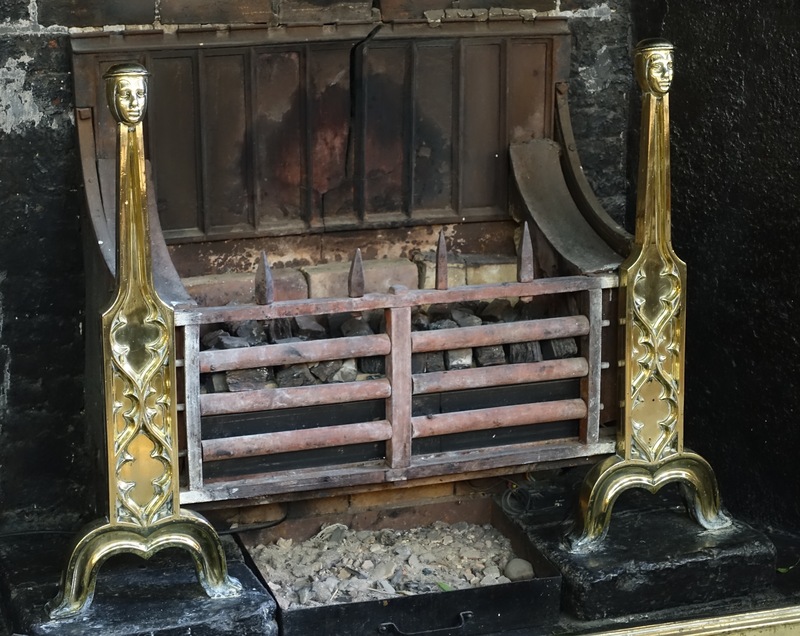 The andirons in the fireplaces have a familiar look to anyone who remembers the telescoped shape “Alice in Wonderland” took after eating the cake marked “Eat me.” Charles Dodgson, who taught mathematics at Christ Church College, is better known as Lewis Carroll, the author of the story. The Alice in the story comes from the daughter of a dean when Dodgson was there in the 1860s. The portrait of Alice Liddell is in the left window. Alice in Wonderland is in the lower left corner. A portrait of the real Alice is in one of the stained glass windows above the tables in the dining room. With the portrait of Alice Liddell are images of the White Rabbit, the Mad Hatter and the Red Queen. 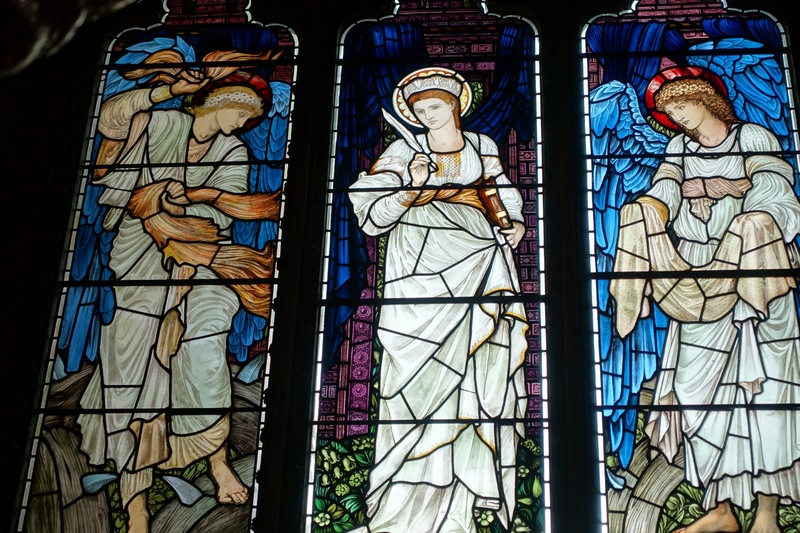 Edith Liddell as St. Catherine in the center panel. 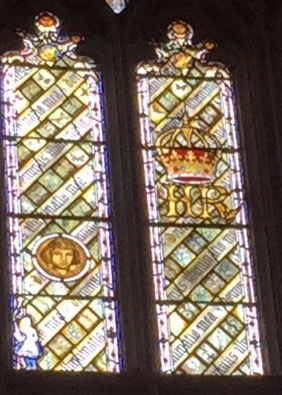 Alice is not the only Liddell daughter to be immortalized in stained glass at Christ Church College. Her sister, Edith, appears as the face of St. Catherine of Alexandria in one of the windows in the chapel. The current exhibit at the Christ Church Picture Gallery comes from Gen. John Guise, who bequeathed his collection to Christ Church in 1767. The collection includes more than 200 paintings and 2,000 drawings, some from Michelangelo (1475-1564), Titian (1480-1576), Leonardo da Vinci (1452-1519), Raphael (1483-1520) and Albrecht Durer (1471-1528). The drawings were especially well displayed in cases with effective lighting, explanations with insightful information on what to look for in the drawings and even a railing to lean on while you read the words and related them to the works. Entitled “Undisputed Masterpieces,” the exhibit marks 250 years since Guise’s death. A nice way to be remembered. Posted on September 15, 2015 September 15, 2015 by jbsaulPosted in TravelTagged Alice in Wonderland, Christ Church College, Eagle and Child Pub, Harry Potter, St. John's College, Women's Institute.